Game statistics are a very important aspect if we want to strive for self-improvement and high level competition. 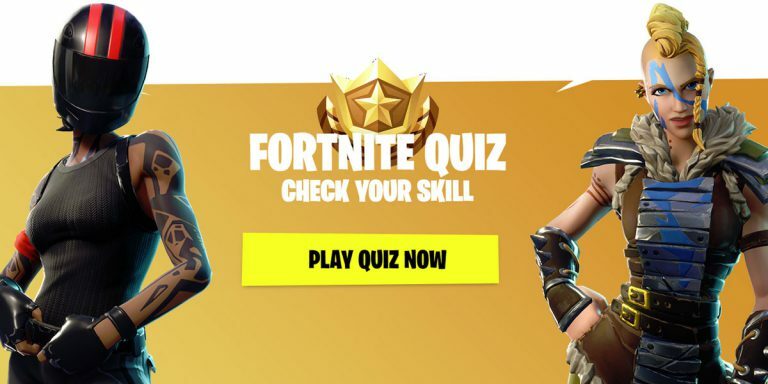 Knowledge from this Fortnite Quiz will allow you to gain the highest places in the competition with other players. Do you know how many damage does bandages heals? How many damage does the assault rifle cause? These types of questions are very important if you’re trying achieve professional or at least semi professional level in Fortnite. Each player, apart from aiming skills, must know when to hide and heal, but also what is needed to build a tower that will allow us to gain advantage over the opponents. Do you think you will be able to get at least 8 on 10 points? How many seconds does bandaging last? How many damage Burst Rifle does? Which shotgun does bigger damage? What maxiumum damage can bandages heal? Which one of those guns deals biggest damage? How many credits epic emote cost? How many materials you need to build one wall, floor, stairs or pyramide? How many HP Cozy Campfire maximum heal? How many guns have silencer? How many seconds does Dance Bomb lasts?